In April 1887 Gauguin travelled to Panama in the company of the artist Charles Laval. After several weeks they left for the idyllic island of Marinique, where they lived in a simple hut. Here Gauguin found the unspoiled, seductive surroundings for which he had been seeking. He drew and painted the picturesque islanders and was fascinated by the graceful movements of the women. However, the primitive living conditions took their toll. Gauguin was incapacitated by fever and dysentery, and returned to France in a weakened condition in November 1887. Shortly after his arrival in Paris he met the Van Gogh brothers. 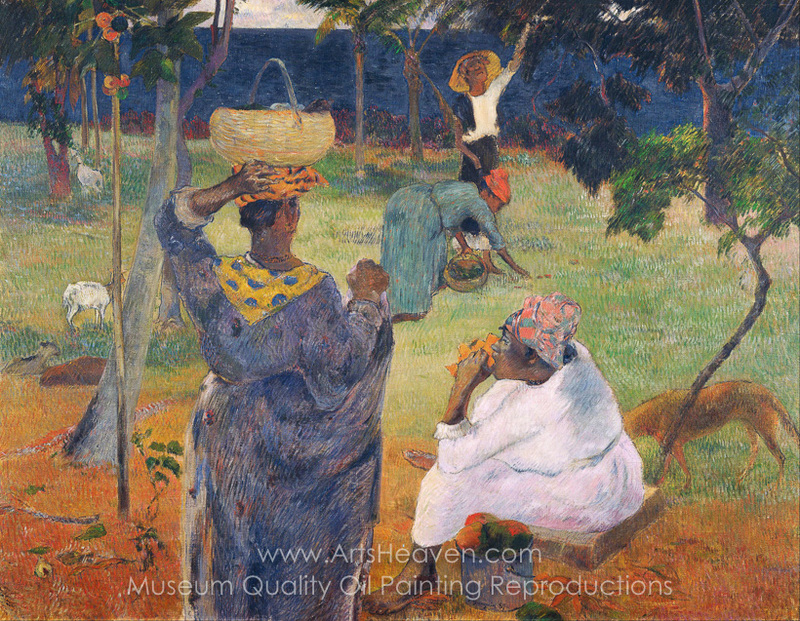 They were so impressed by Among the mangoes at Martinique, which Gauguin had produced on Martinique, that they purchased the painting for their own collection. It was the most expensive acquisition the brothers would ever make. 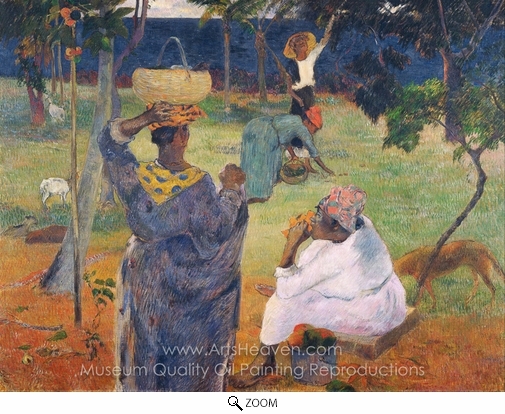 Decorate your home or office with our beautiful museum quality art reproduction of Paul Gauguin Among the Mangoes at Martinique painting. Why settle for a print, poster, giclee or canvas transfer when you can grace your walls with a genuine oil on canvas painting reproductions for sale at up to 75% below gallery prices. You are commissioning an authentic hand-painted oil painting on quality artists canvas. Painted by professional artists brushstroke-by-brushstroke with attention to all details. Order your Masterpiece today and get Free Shipping to your door direct from our studio.